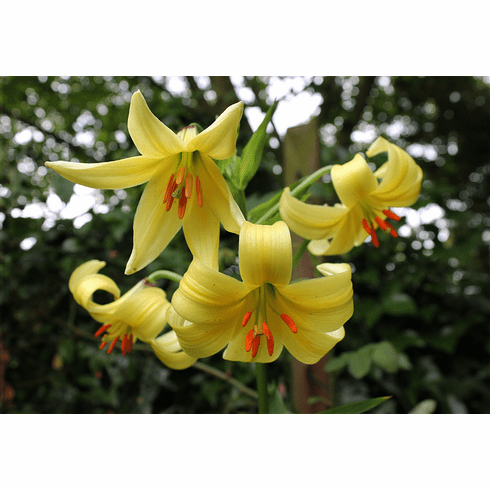 Native to wooded clearing and subalpine zones of Transcaucasia and the southern shores of the Black Sea, Lilium szovitsianum is equally at home in the garden when provided with its needs as is Lilium monadelphum . Carrying a strong fragrance, these pendant flowers are straw yellow in color and occasionally have a few spots. Requiring a well drained but heavy soil, they dislike being moved. Said to be long lived providing conditions are to it liking but it does tolerate a wide range of soil as long as they are well drained. Slow growing it can take many years to produce a good, flowering size bulbs. Title photo taken by Rictor Norton & David Allen titled as 'Summer Garden'. Copyright Rictor Norton & David Allen. Source was Wikimedia Commons. Original photo cropped. This file is licensed under the�Creative Commons�Attribution-Share Alike 3.0 Unported�license. Photo insert #1 taken by Pontus Wellsten in evenly wooded area, Northamptonshire, United Kingdom. Photo insert #2 of plant grown from seed by Bob Gibson. Insert #3 was taken in Shahdag National Park, Qusar, Azerbaijan by Khagani Hasanov. Copyright Khagani Hasanov. Original photo cropped. This file is licensed under the�Creative Commons�Attribution-Share Alike 3.0.